Summer may be fading into the distance, but for one Bend company summer 2019 is just around the corner. Adventure Tent Trailers come from Bend based Freespirit Recreation (www.gofsr.com), and offer the best nights sleep in the outdoors with luxury above ground “Glamping” tents mounted to rugged and spacious Manley trailers. Big Mountain Adventures provides one stop camping equipment including a gourmet cooking kitchen, glasswear, camp lighting, chairs and a complete list of incredible, local, out of the way adventures in Central Oregon to go explore. The growing trend of Glamping (luxury camping) recently moved to Central Oregon offering travelers and campers new choices for exploring Oregon and beyond this year. Big Mountain Adventures has expansion plans for two rental locations in Bend and Portland later this spring. Adventure Tent Trailer rental prices fluctuate based on season, location and availability. At Big Mountain Adventures peak season rental (May-September) ranges from $599 a week for a two man fully loaded adventure tent trailer to $995 a week for a four man tent trailer with extra goodies inside like a welcome kit with local Bend hotel discounts and Belgian chocolates aboard. 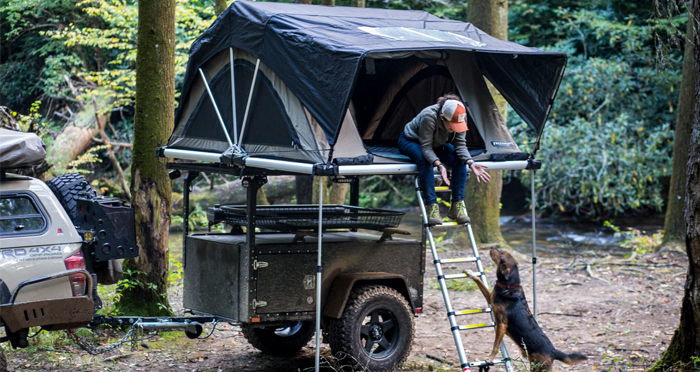 Adventure Tent Trailer rentals deliver a refined and comfortable taste of the outdoor life whether staying local or taking the road trip of a lifetime through the backcountry of Oregon. Even Alaska is not too far to drive in one of Big Mountain Adventures all new fleet of adventure tent trailers.